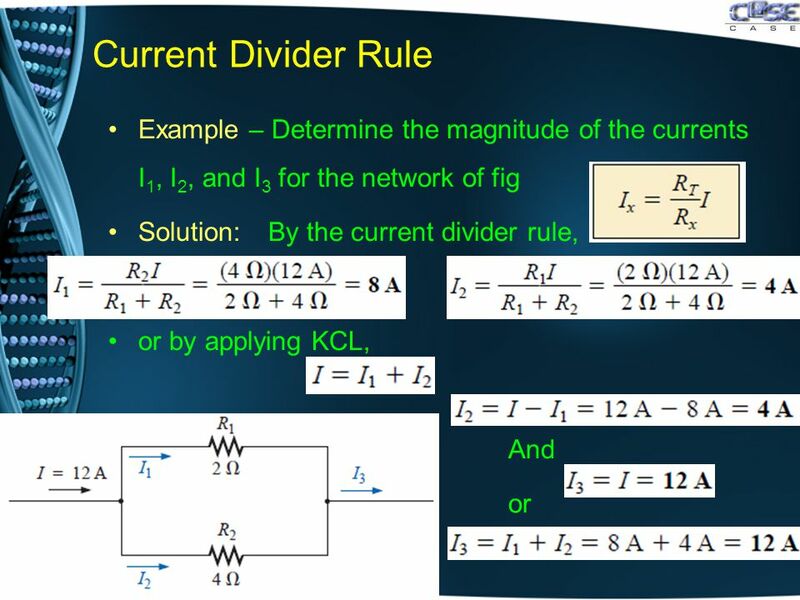 ELECTRICITY & MAGNETISM (Fall 2011) LECTURE # 14 BY MOEEN GHIYAS. 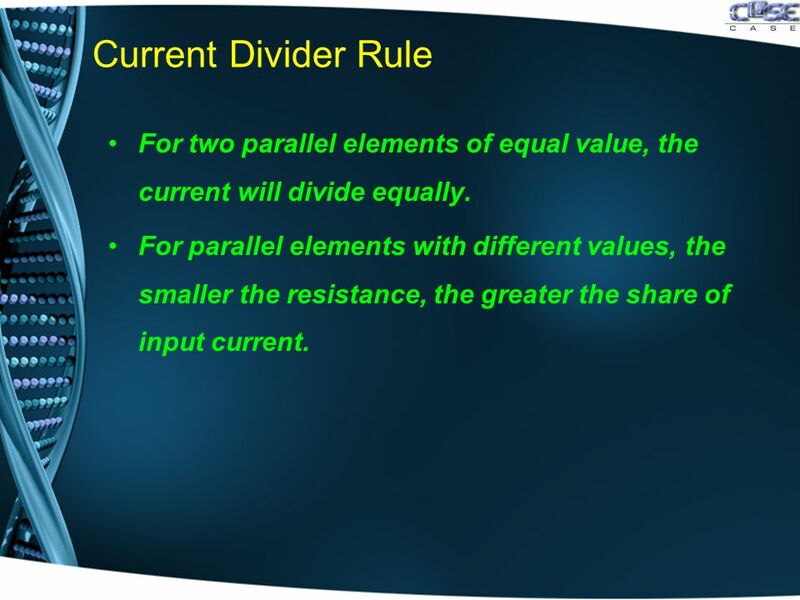 4 Current Divider Rule For two parallel elements of equal value, the current will divide equally. 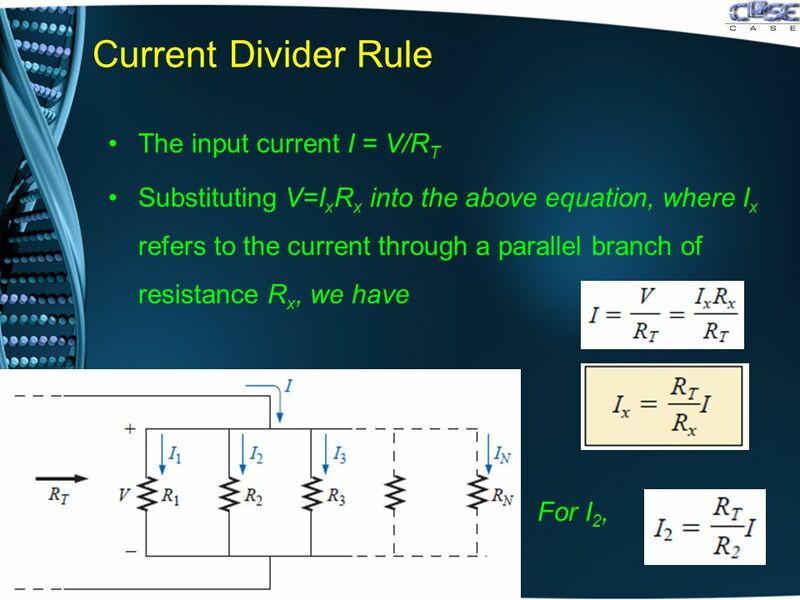 For parallel elements with different values, the smaller the resistance, the greater the share of input current. 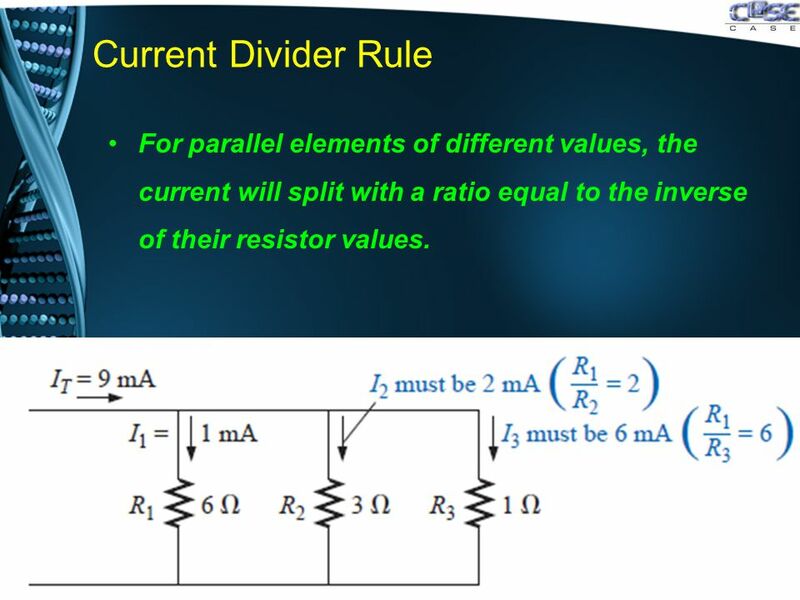 5 Current Divider Rule For parallel elements of different values, the current will split with a ratio equal to the inverse of their resistor values. 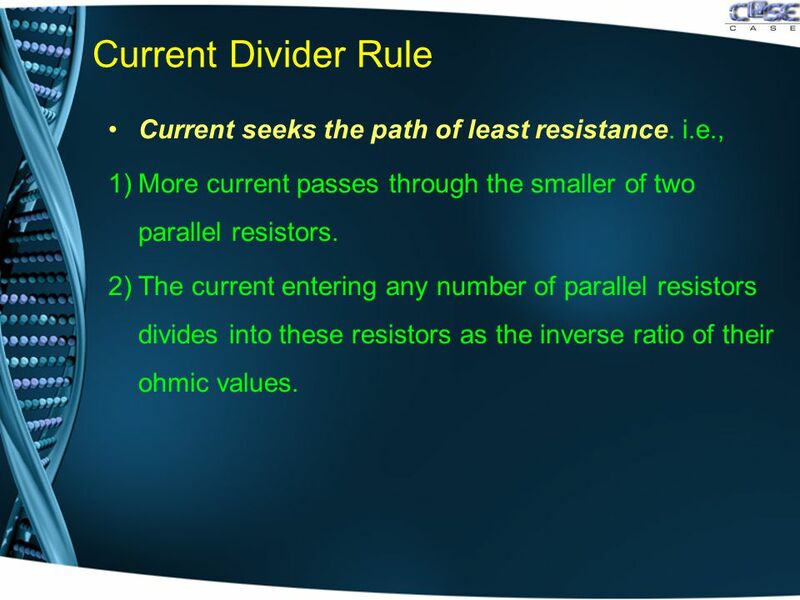 9 Current Divider Rule Current seeks the path of least resistance. 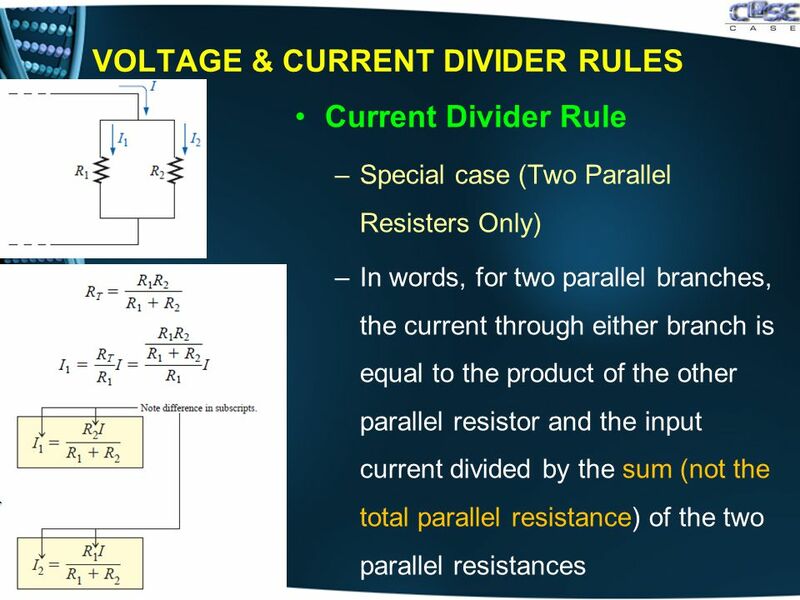 i.e., 1)More current passes through the smaller of two parallel resistors. 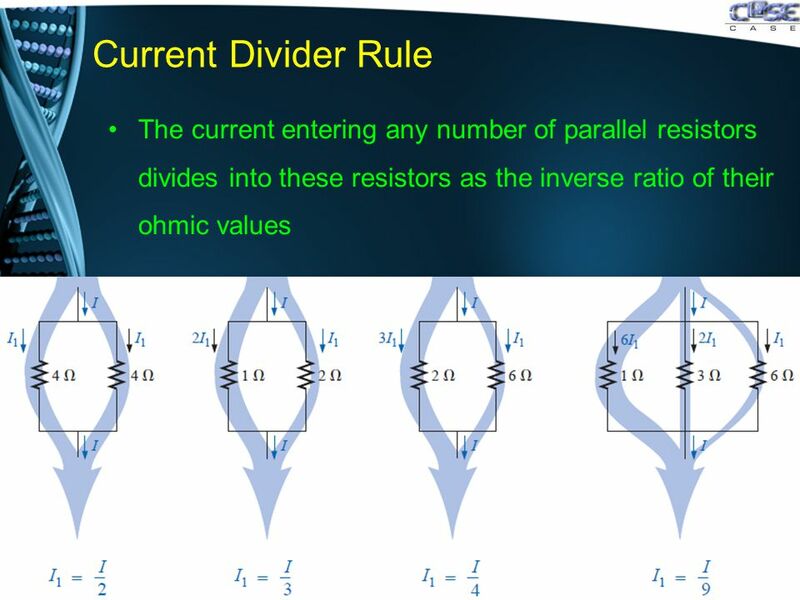 2)The current entering any number of parallel resistors divides into these resistors as the inverse ratio of their ohmic values. 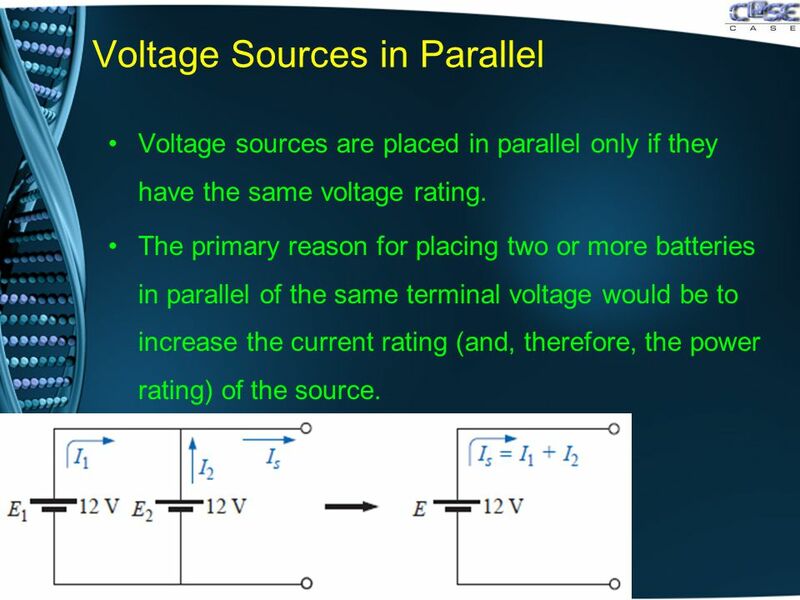 11 Voltage Sources in Parallel Voltage sources are placed in parallel only if they have the same voltage rating. The primary reason for placing two or more batteries in parallel of the same terminal voltage would be to increase the current rating (and, therefore, the power rating) of the source. 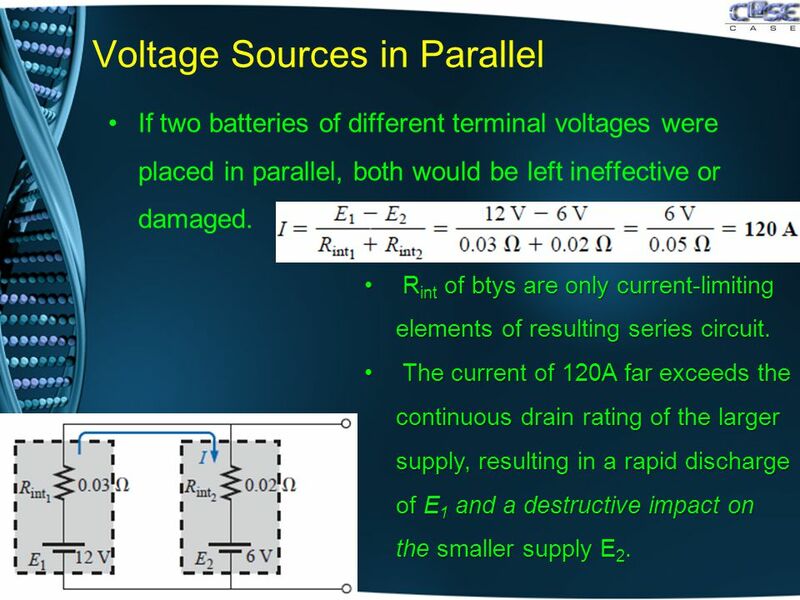 12 Voltage Sources in Parallel If two batteries of different terminal voltages were placed in parallel, both would be left ineffective or damaged. R int of btys are only current-limiting elements of resulting series circuit. R int of btys are only current-limiting elements of resulting series circuit. The current of 120A far exceeds the continuous drain rating of the larger supply, resulting in a rapid discharge of E 1 and a destructive impact on the smaller supply E 2. The current of 120A far exceeds the continuous drain rating of the larger supply, resulting in a rapid discharge of E 1 and a destructive impact on the smaller supply E 2. 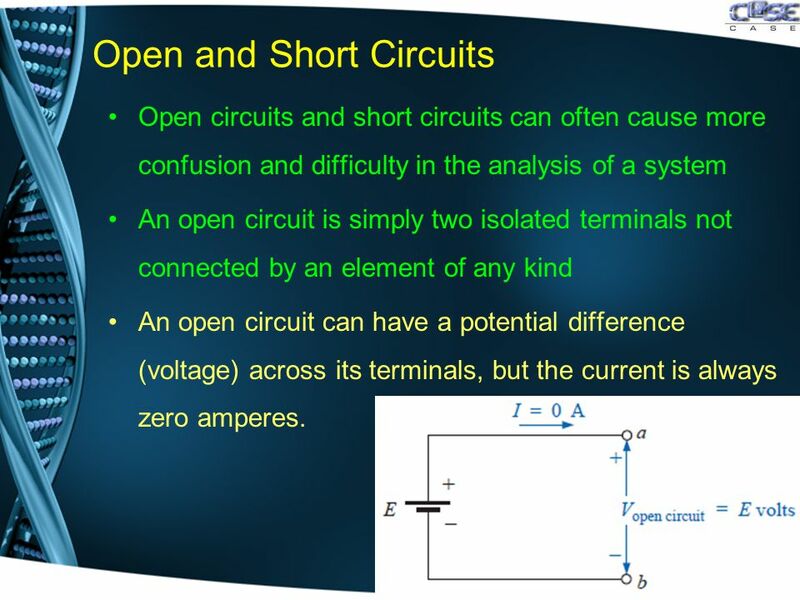 13 Open and Short Circuits Open circuits and short circuits can often cause more confusion and difficulty in the analysis of a system An open circuit is simply two isolated terminals not connected by an element of any kind An open circuit can have a potential difference (voltage) across its terminals, but the current is always zero amperes. 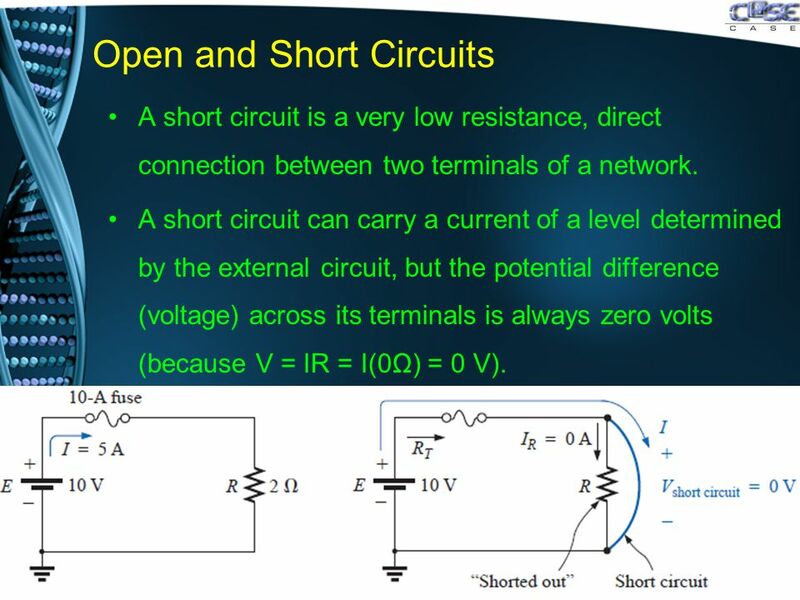 14 Open and Short Circuits A short circuit is a very low resistance, direct connection between two terminals of a network. 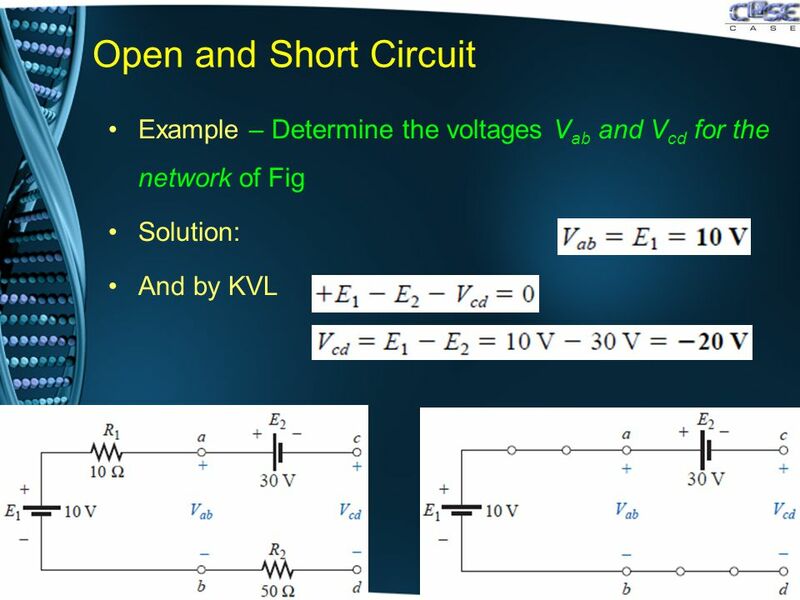 A short circuit can carry a current of a level determined by the external circuit, but the potential difference (voltage) across its terminals is always zero volts (because V = IR = I(0Ω) = 0 V). 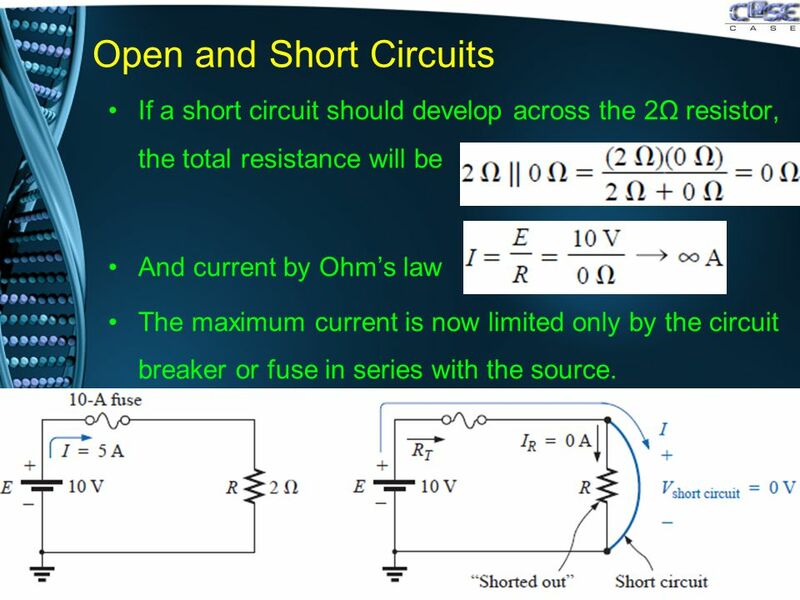 15 Open and Short Circuits If a short circuit should develop across the 2Ω resistor, the total resistance will be And current by Ohm’s law The maximum current is now limited only by the circuit breaker or fuse in series with the source. 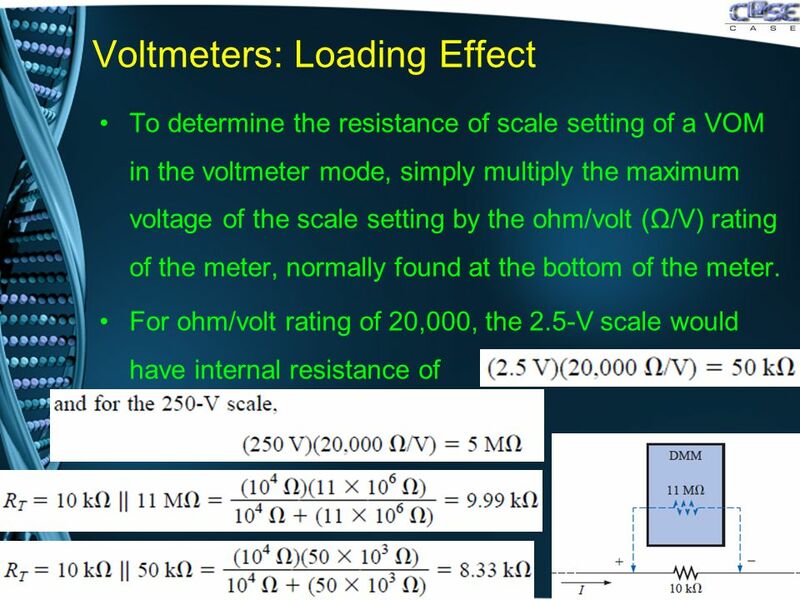 18 Voltmeters: Loading Effect The loading of a network by the insertion of meters is not to be taken lightly, especially in research efforts where accuracy is a primary consideration. 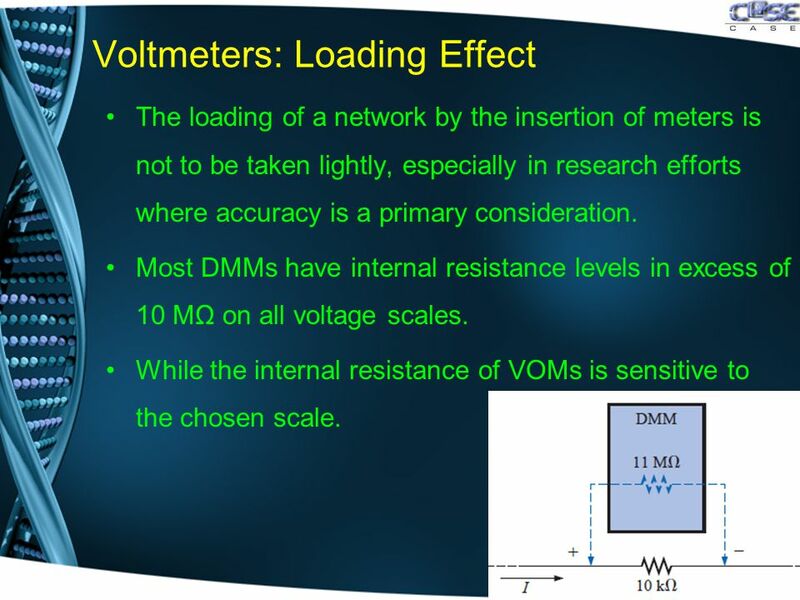 Most DMMs have internal resistance levels in excess of 10 MΩ on all voltage scales. While the internal resistance of VOMs is sensitive to the chosen scale. 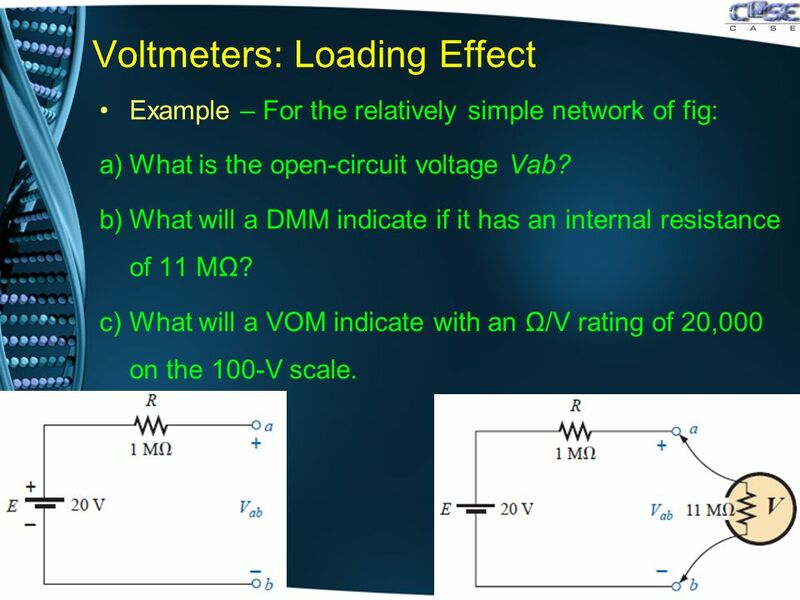 20 Voltmeters: Loading Effect Example – For the relatively simple network of fig: a)What is the open-circuit voltage Vab? 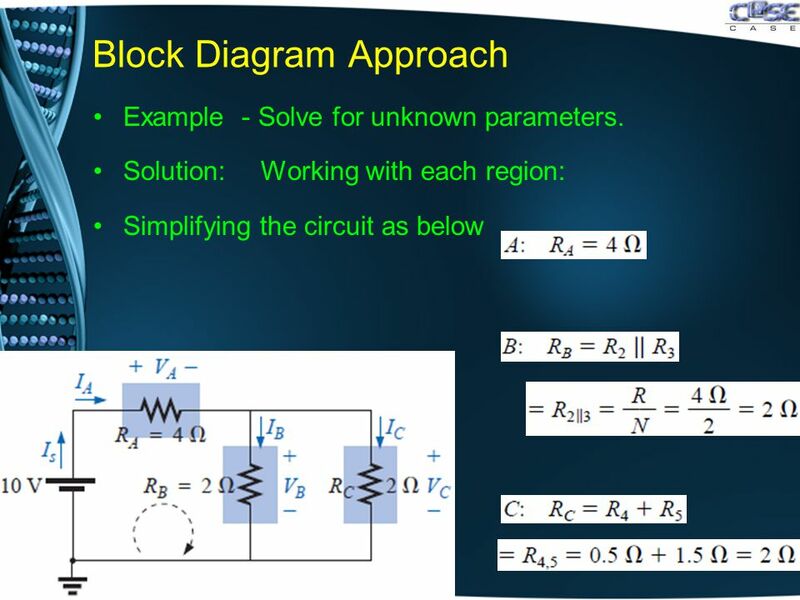 b)What will a DMM indicate if it has an internal resistance of 11 MΩ? 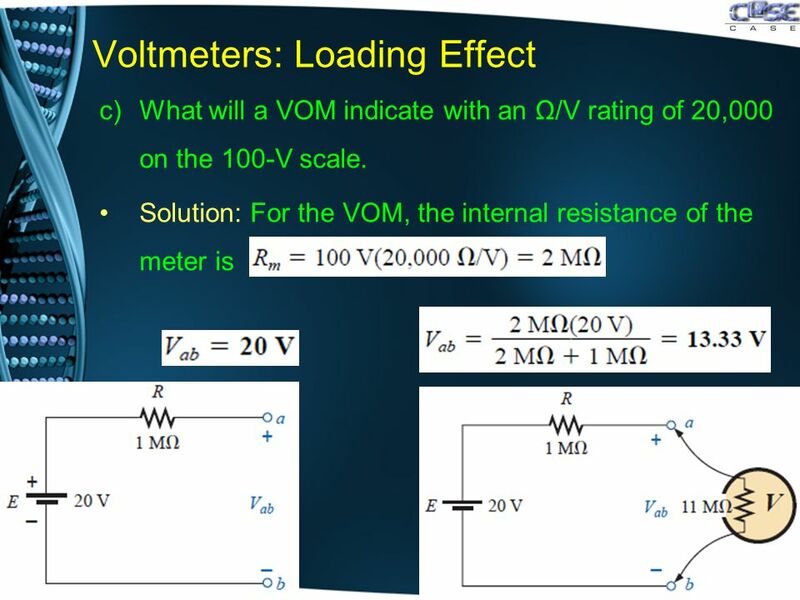 c)What will a VOM indicate with an Ω/V rating of 20,000 on the 100-V scale. 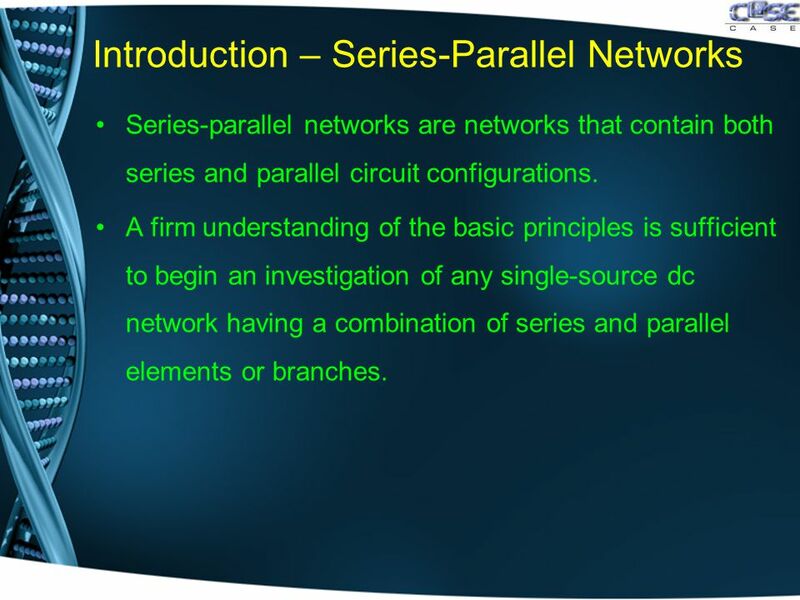 23 Introduction – Series-Parallel Networks Series-parallel networks are networks that contain both series and parallel circuit configurations. 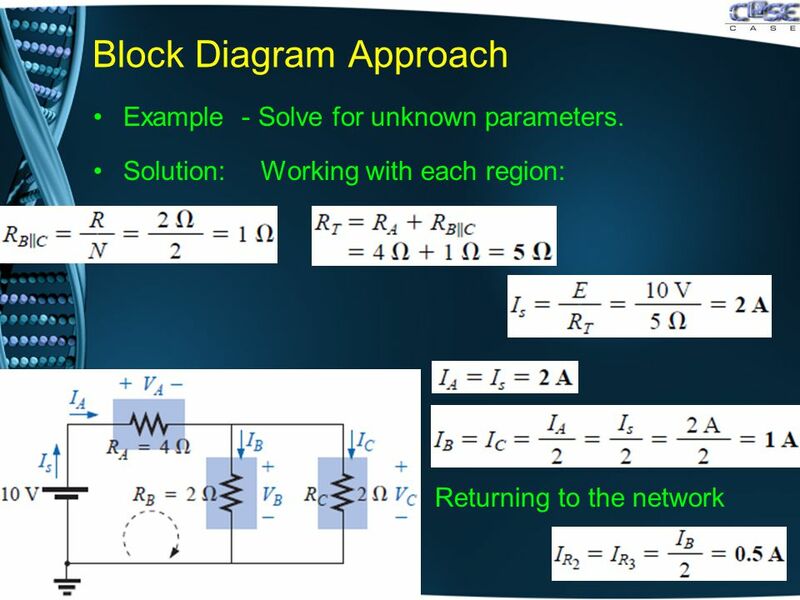 A firm understanding of the basic principles is sufficient to begin an investigation of any single-source dc network having a combination of series and parallel elements or branches. 24 General Approach Take a moment to study the problem “in total” and make a brief mental sketch of the overall approach. 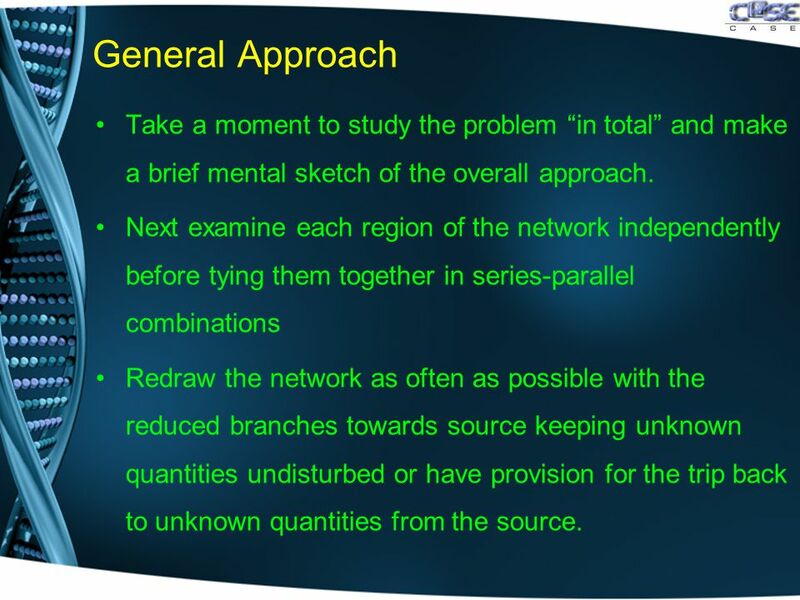 Next examine each region of the network independently before tying them together in series-parallel combinations Redraw the network as often as possible with the reduced branches towards source keeping unknown quantities undisturbed or have provision for the trip back to unknown quantities from the source. 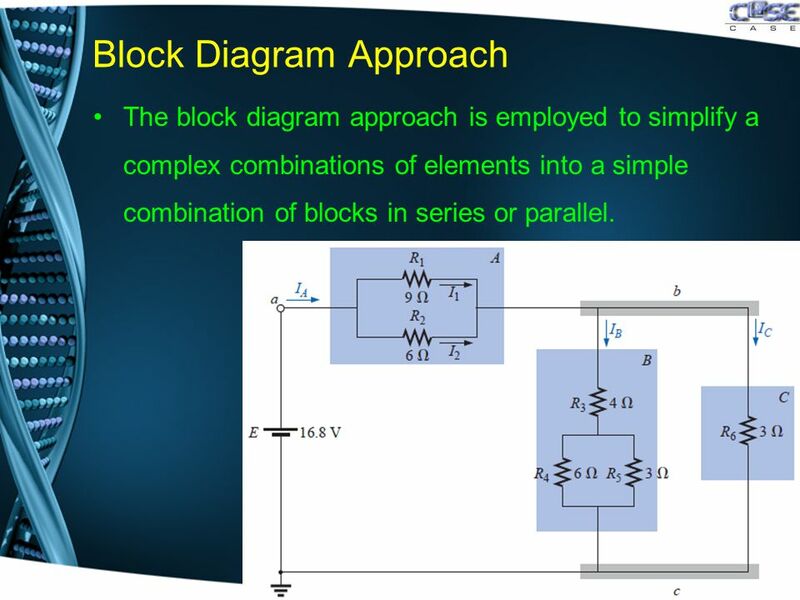 27 Block Diagram Approach The block diagram approach is employed to simplify a complex combinations of elements into a simple combination of blocks in series or parallel. 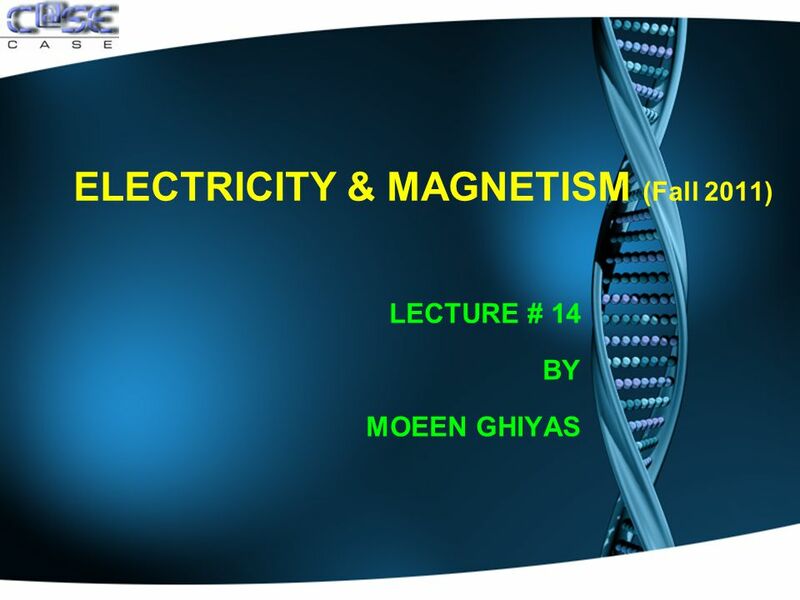 Download ppt "ELECTRICITY & MAGNETISM (Fall 2011) LECTURE # 14 BY MOEEN GHIYAS." 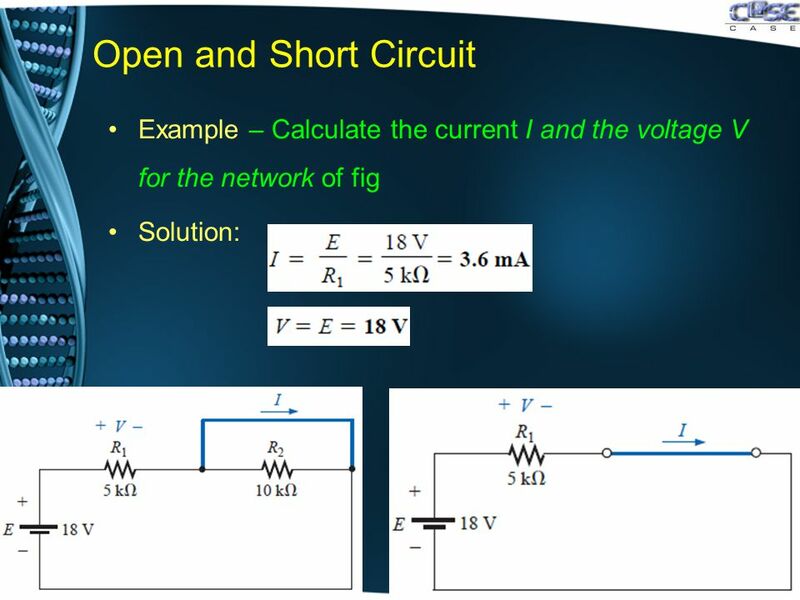 Quiz 1 a) Find the currents i1 and i2 in the circuit in the figure. 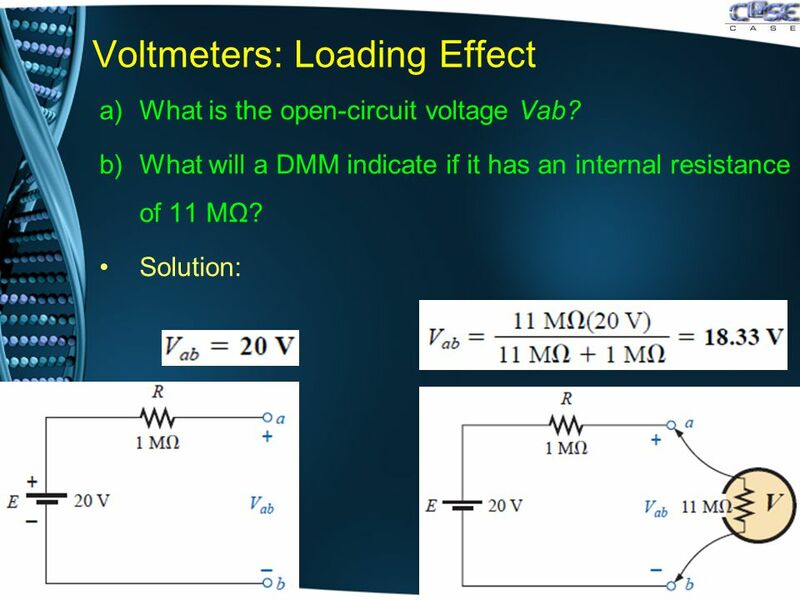 b) Find the voltage vo. c) Verify that the total power developed equals the total power. ELECTRICITY & MAGNETISM (Fall 2011) LECTURE # 11 BY MOEEN GHIYAS. 3/6 do now A piece of copper wire with a cross-sectional area of 3.0 x 10-5 meter2 is 25 meters long. How would changing the length of this copper wire. 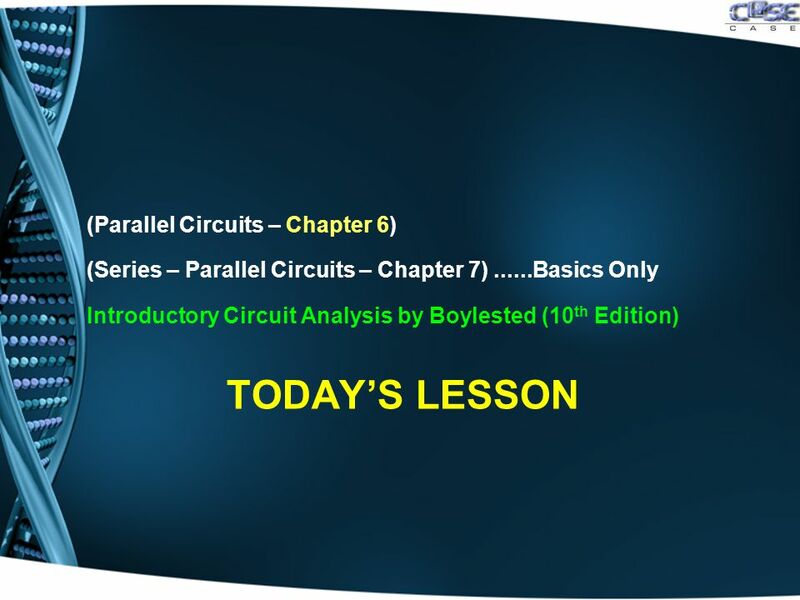 Chapter 7 – Serial-Parallel Circuits Introductory Circuit Analysis Robert L. Boylestad. 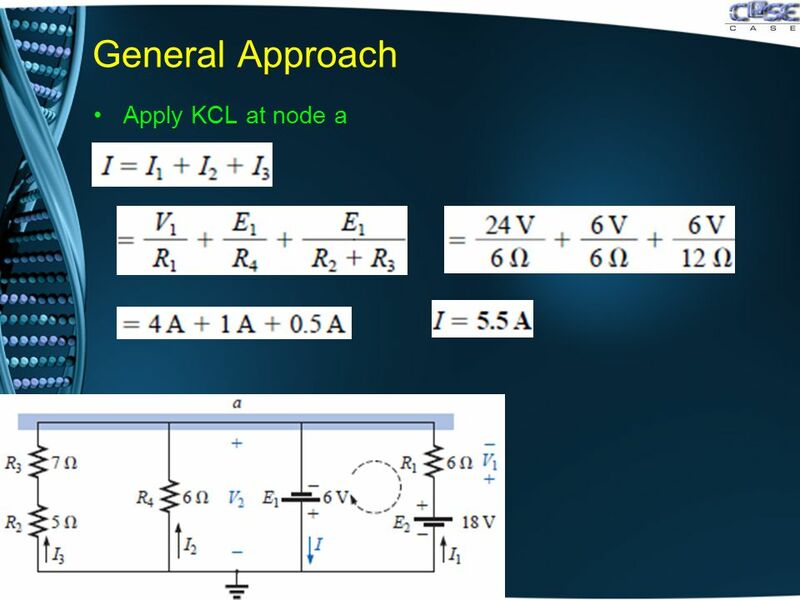 ELECTRICITY & MAGNETISM LECTURE # 7 BY MOEEN GHIYAS. 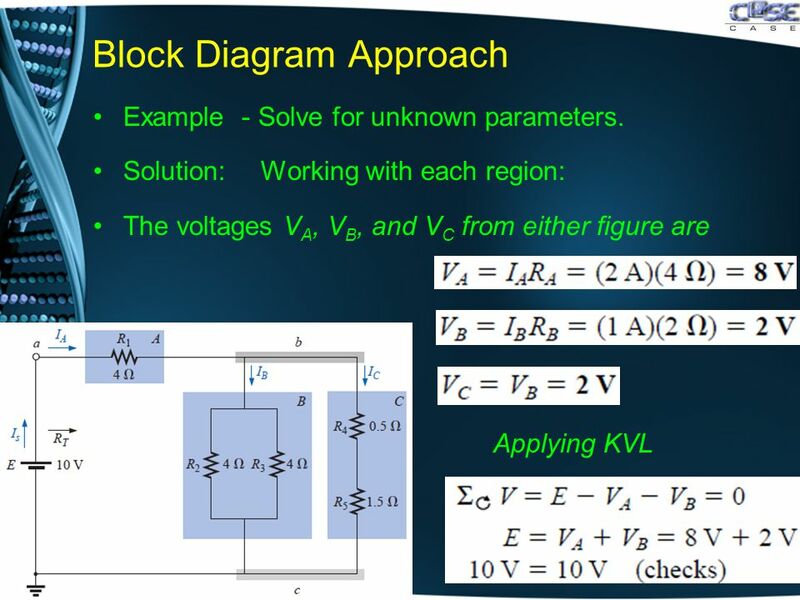 1 Lecture 2 Dr Kelvin Tan Electrical Systems 100. 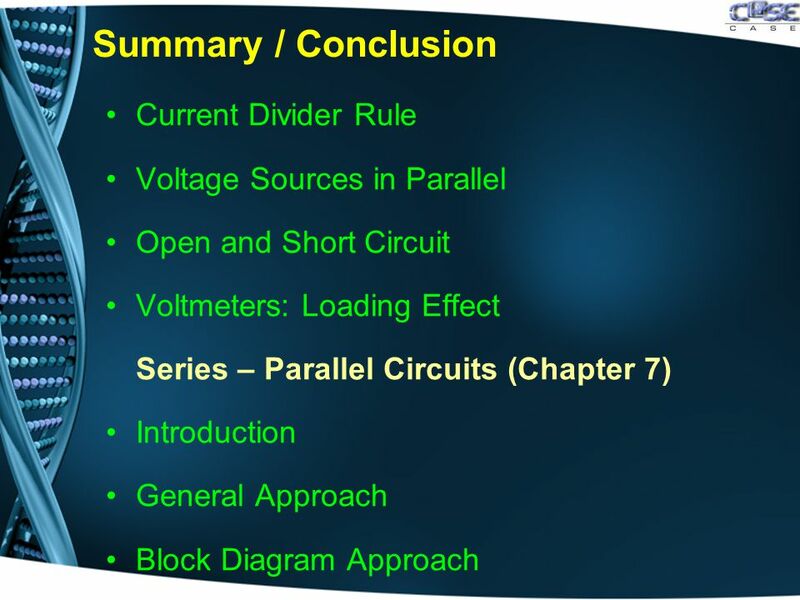 Chapter 6 – Parallel dc Circuits Introductory Circuit Analysis Robert L. Boylestad. 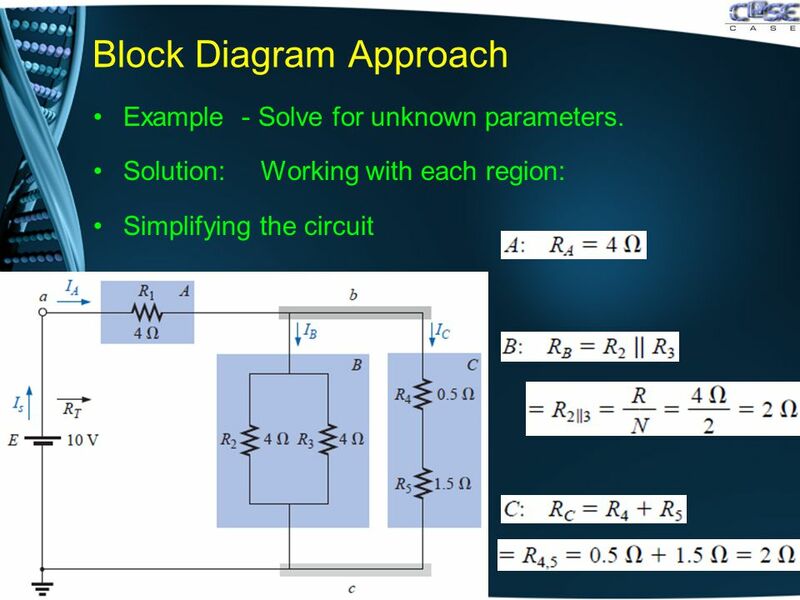 Lesson 4: Series Circuits. Learning Objectives Identify elements that are connected in series. 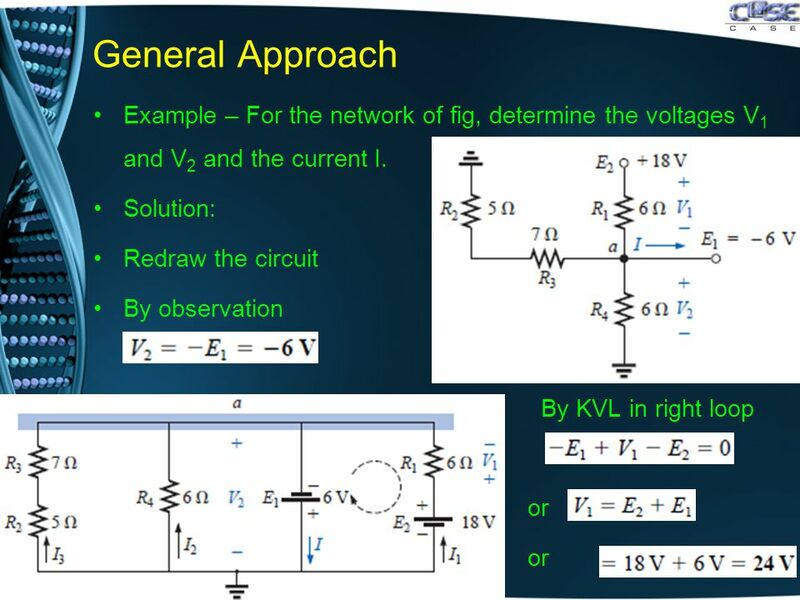 State and apply KVL in analysis of a series circuit. Determine. بسم الله الرحمن الرحيم FCI. 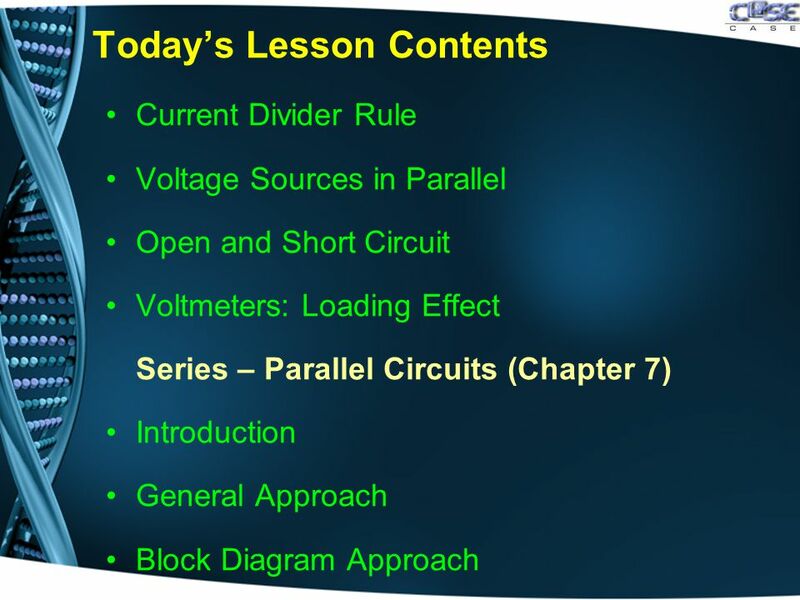 Chapter 6 Series and Parallel Circuits 1 of 81 MECH1100 1 of 81 Chapter 6 Series and Parallel Circuits MECH1100 Topics Identifying Series- Parallel Relationships.